I've shared the kids' room, the living room, the kitchen and middle room, and now the master bedroom. We've been in this rental for six months now and other than the studio feel like we're settled. Almost everything has found it's place, the walls are full, and most importantly it feels like home. Knowing we'd likely only be living here for a year, it was important to get things unpacked and arranged as quickly as possible so that we could really enjoy our time here rather than seeing it as a temporary space. That said, I'm not the kind of girl that can have her house set up in a week. For some reason (and maybe that reason is named Ruby) I get things done in layers and spurts. I like to get things where I think they should go and then see how it works for us. I need to feel out traffic patterns and whether or not a certain arrangement is useful. Our bedroom wasn't a complicated space to set up but it took me up until the day before I took these photos in late March to decide what to put on the walls. 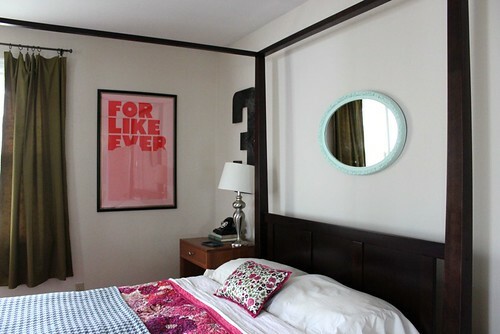 We didn't have much on the walls in our old bedroom besides two mirrors and a giant gas station number (still included in this one) and we had a completely different furniture arrangement. We also purchased our first ever bed frame for Christmas! This means we're adults now, right? 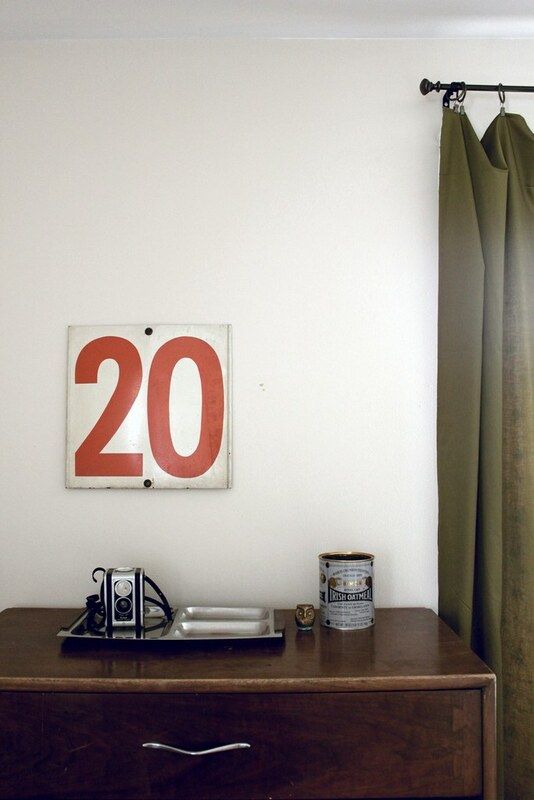 I brought in a few things I had hanging in my studio in our last rental like this orange and cream gas station signage as well as some things that were in storage tubs such as the For Like Ever print and a matted photograph from a friend in college. The bench finally got it's coat(s) of paint and was given a home at the end of our bed. In a perfect world I would have adorable pillows stacked in the corner but it currently acts as a clean laundry catch all. We have two bedspreads and a duvet (gift from a special lady) that we regularly keep on our bed during the colder nights but keep the duvet stored in our closet when it's warmer. 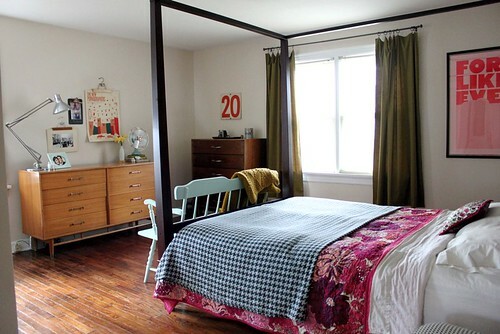 The hounds tooth bedspread is from Urban Outfitters and still one of my favorite patterns. The pink bedspread is from the Liberty of London line from Target a few years back. The duvet (not shown) is from Anthropologie. I've always loved the look of random photo collections hanging near a bed. I had photos of me and my best friends taped to the wall through high school and college but stopped when I got married because it felt too 'young' and uncouth. Ha! I've made this one a little more grown up by using photos and art with common themes and colors. The stair case is where Brett and I spent one of the last evenings chatting away before Christmas break our first semester. We weren't dating yet but it was obviously headed that direction. He was off to India and I was going home and it felt like we'd never see each other again. Ahhh, young love. The old photo is a copy of one my Meemaw gave me. I'm not really sure about the story behind it but it's right after her and my PawPaw's wedding ceremony. Mom, remind me of those details next time we talk. They look so happy and smitten. The Enid Collins purse was given to me by my Grandmother and has seen some use lately but is usually carefully placed on a little shelf in my closet to keep certain toddlers from coloring on it. 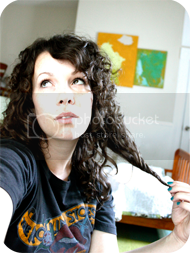 The band poster above my dresser was a purchase from Domestica earlier in the year. I fell in love with the colors and design right away and THEN realized it was from a favorite band of ours! The clipboard used to be in the kids' room but was a small one from Staples that I painted with chalkboard paint. I plan on rotating photos and the chalkboard paint makes it fun to add details. The matted photo is from a friend from college. I made the curtains for this room the same way I did in the kids' room by stitching almost all the way around all four sides of cut fabric and a vintage sheet (the lining), turning it right side out, stitching all the way around it, ironing it, and hanging it from clips. It's fast, easy, and allows for the curtain panels to slide back and forth without much tugging. I removed the DIY lighting from above the bed for photos as it was getting in the way of some clear shots but we keep it up all of the time. It's good mood lighting for...umm...reading...and stuff. Ha! The only thing left to show is my studio but don't hold your breath. I may save that one until the very end of the year the way things are going right now. It's full of half-finished projects and those last few boxes we haven't unpacked. Maybe I shouldn't even look in them and donate them to Goodwill, huh! Also, our home is rarely as clean and clutter free as it is in these images because we lead busy lives and have little ones like many of you. Ask my neighbors! However, all my messes are colorful and all my piles a sign of fun being had. 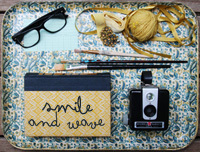 pulling it together and making it work in my recent E-Course, Style Your Space. It includes guidance and resources on finding your specific style, how to work with what you have, getting the most out of your arrangements, and four fun DIY's to make your space more fun. Details here. I'm so thankful for our current house. Even our leaky basement. We no longer have to worry about where to go when the tornado sirens go off! 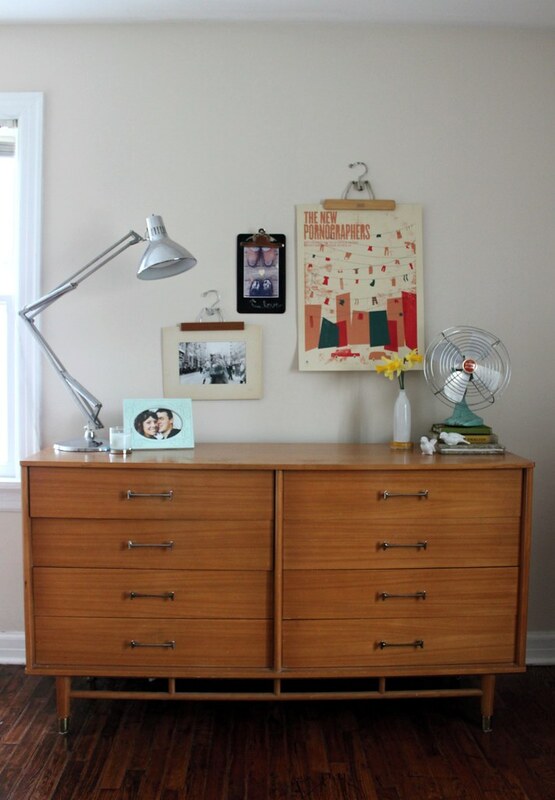 What's your favorite thing about your space? Do you have a lot of half-finished corners? Do you like to rearrange every few months? How do you keep it feeling fresh? Furniture: End table and two dressers, Craigslist. Bench and chair, thrifted. Lamp, K-Mart. 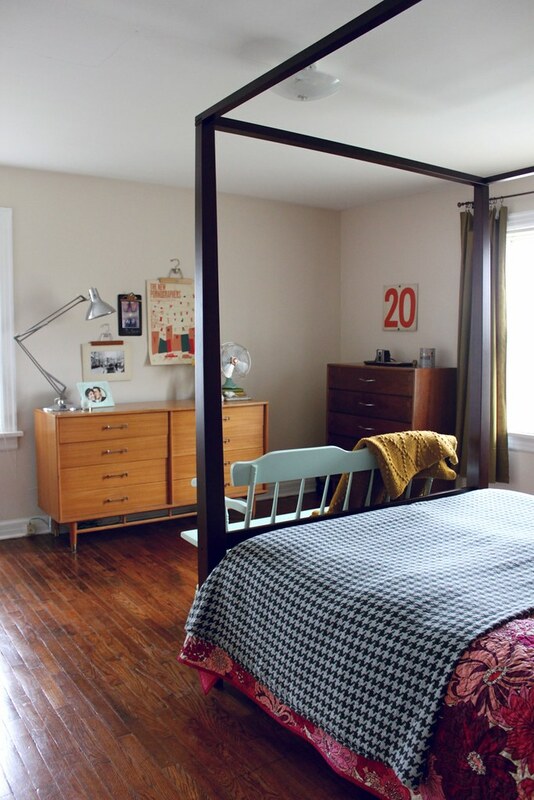 Bed frame, AllModern. Lighting & Accessories: Large industrial light, thrifted. Large gas station #3 and smaller metal gas station sign, thrifted. 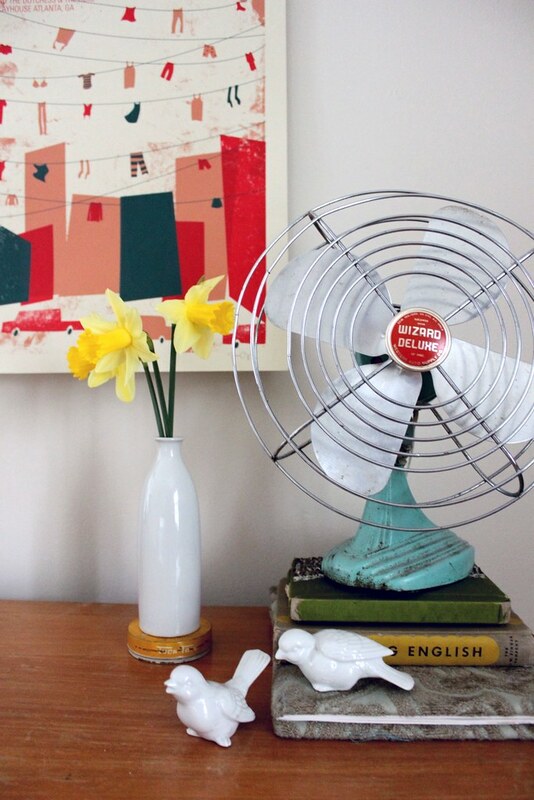 Vintage fan, books, and birds, thrifted. Picture frame, thrifted and painted. Fake rotary phone, found but originally from Pottery Barn. Art: For Like Ever print originally from ReForm School. Frame purchased from Michael's Craft Store. The New Pornographers poster, Domestica. Linens: Hounds tooth bedspread, Urban Outfitters. Liberty of London bedspread, Target. Liberty of London pillow, thrifted but originally from Target. Cross pillow and curtains, handmade by me. Afghan, thrifted. 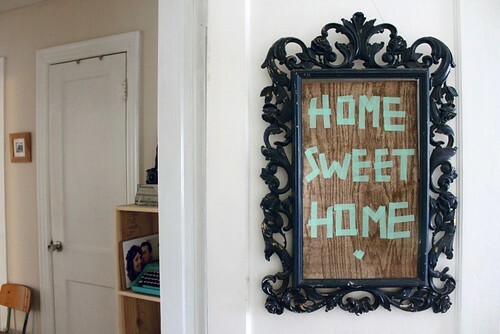 I become more and more in love with your home the more you share! It's brilliant and beautiful. You are great at decorating. anyways...i love all your personal touches...it looks perfect! Such a beautiful home - thanks for sharing! So inspired! you're really a home decorating expert. It should be your profession. 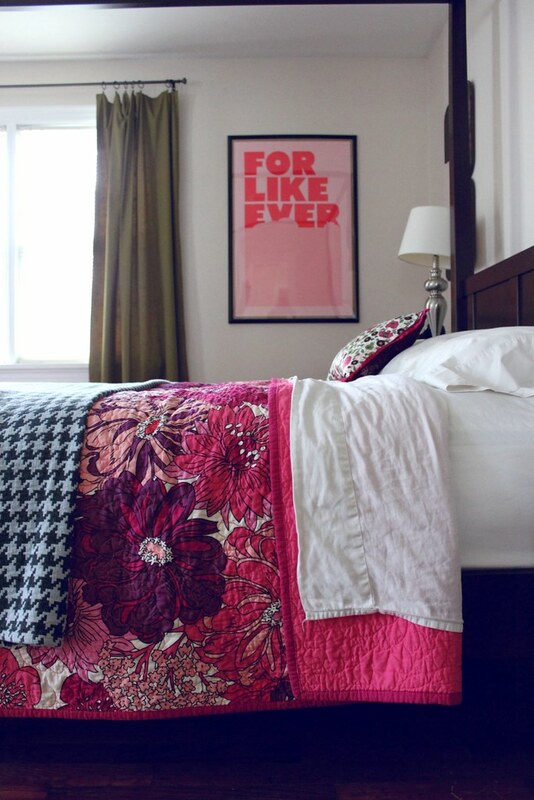 I love that quilt, and that coming from someone who usually avoids all things pink! Thanks Rachel! I was the one who Tweeted you and asked about the Target bedspread. Don't you love the colors? I am moving soon, and needed some ideas. I am so glad to have this in my back pocket now. Have a great weekend! Wow, Jill, thanks! That means a lot coming from you!! Thanks, everyone! I appreciate all of your sweet words! I love the gas station sign above the dresser. 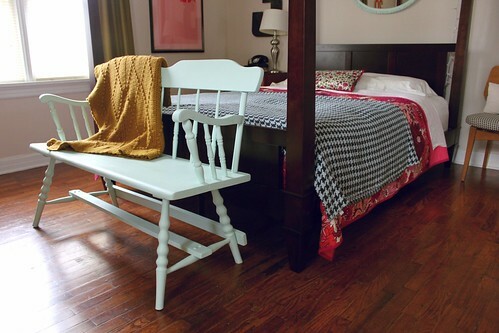 Your room feels very relaxed and eclectic. Good Job, it looks great! Gorgeous. No surprise, though! Love the details and your taste, Rachel. Thanks for sharing! so cute! we've been rearranging our spaces over here. i had to give my husband his own little office/military room to house his navy apparel. too many uniforms for a reservist. honestly. You have such a sense of style! Your house looks gorgeous! Every little detail makes it amazing! 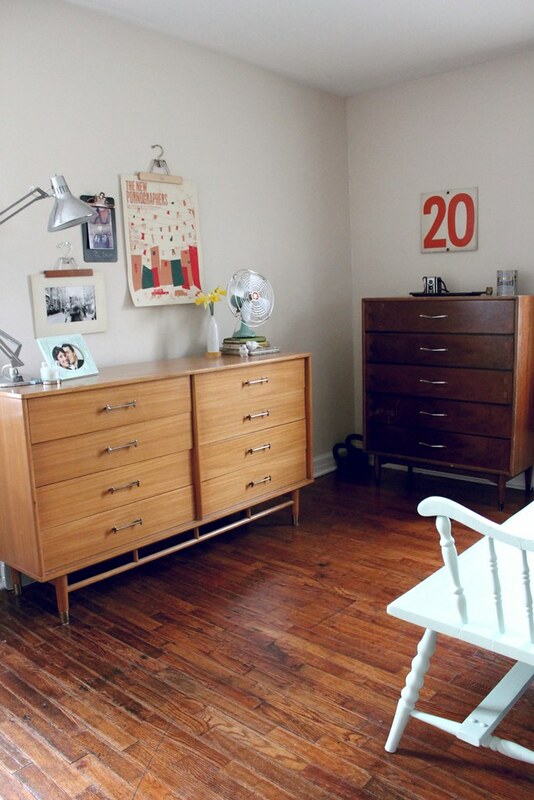 i like the furniture, but I would add some fabric on the top of the bed :) but i really like your chest of drawers! You have such a fantastic eye for putting everything together. 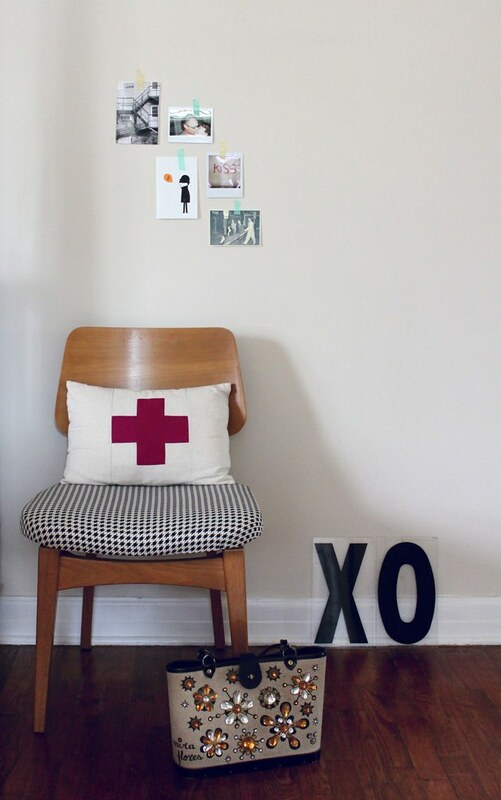 I love how you combine colors and textures with all of your vintage finds. That Pink floral bedspread is to die for! My house is way too cluttered and needs a serious purging so I can get back to decorating. I have way too many piles everywhere. It's just hard making the time to do it. Seeing your home really gives me the motivation though! Rachel - I've been loving your house tour - and am particularly inspired by your approach, even when you know it won't be home forever. We have bought our forever home - and after moving from renovation project to project we finally bought a house that was finished. After making a few 'inevitable' changes we seem to have created a 'renovation project'! As it's a tall victorian house it's hard to decorate quickly but I've accepted it's for the long term and have stopped getting frustrated! I LOVE the hangers for picture rotation, off to pin it on my inspiration board. can i come over? beautiful, as always miss rach! So sweet, I had a Mee Maw and Paw Paw too! 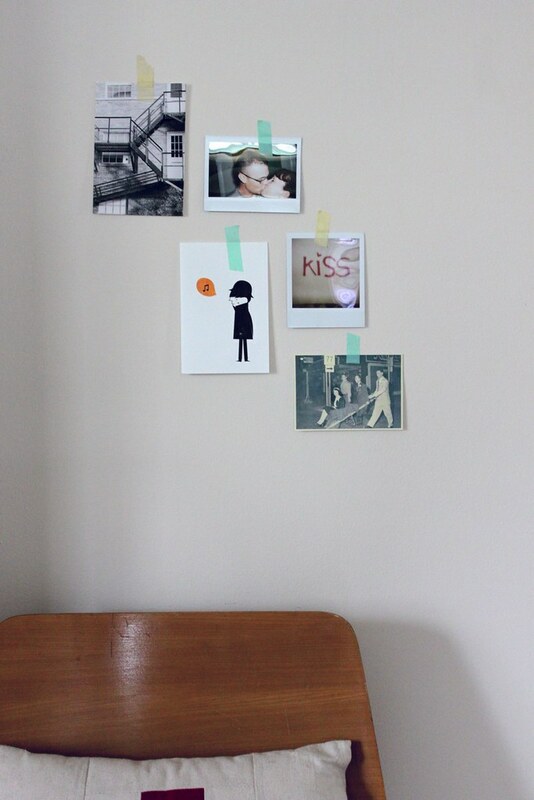 I love the pants hangers for photo and print and other hangups! I am totally doing that! I also really like your mix of colors on the bed! So pretty. I DIE for the houndstooth! It's a bit of an obsession for me. I wonder if UO still has that. Fabulous! And those floors? Amazing. It looks great, Rachel! I particularly love the bench at the foot of your bed. I wish we had room for one in our bedroom. 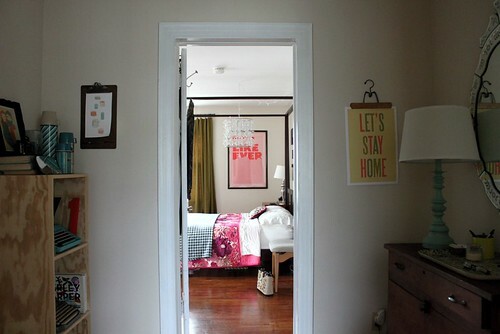 everything looks so personal and wonderfully homey! and i must add that i absolutely love your floors. Beautiful room! I also can't get a place set up quickly...we've been living in our apartment for a month and I still have unfinished corners and rooms. My reason's name is Max :) I'm also going back through your archives getting tips on creating a joint space for a boy and a girl. 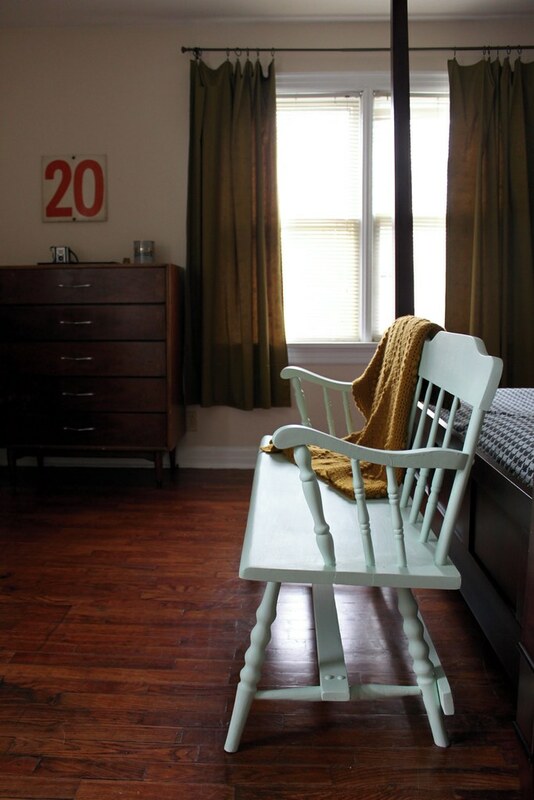 Our little boy's room will be shared by a girl come September and I LOVE what you did with your kiddos' shared space. Thanks for the inspiration! looks fantastic!! 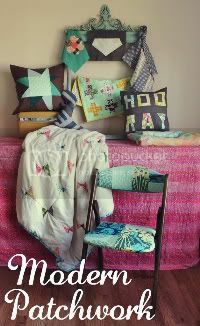 i really love the quilt & bench. 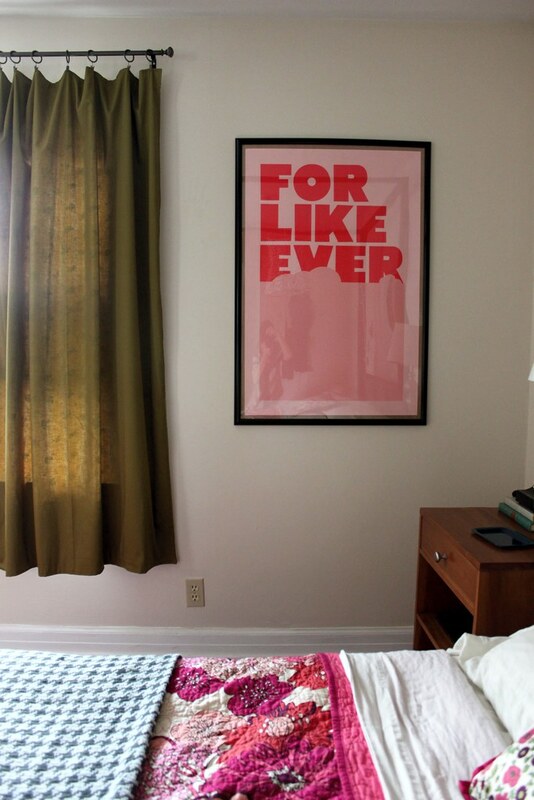 and that new pornographers poster is amazing.. i need to find one! Love those ceramic birds! They are super familiar to me. I'm selling candles ones just like that in my shop! All of it's great, but I'd not seen painted clipboards before. Very cool! Where did you get your curtain rods? I want something new and fresh and I've looked everywhere I can think of. You have the cutest home ever! I love it, I wish I was so imaginative! It looks delightful! I especially like the bench at the foot of you bed. gorgeous! Beautiful :) Love your style! My husband gave me a living room redo for my birthday (yesterday) so I've been going thru your e-course and having so much fun coming up with ideas! Our town had it's citywide garage sale yesterday and I was able to pick up some furniture and accessories to add to my ever-growning pile. I just need to decide on paint colors and curtains and get started! What a gorgeous room so beautifully put together. My favorite part is definitely the dresser and the artwork. I wouldn't mind taking that fan home with me too!